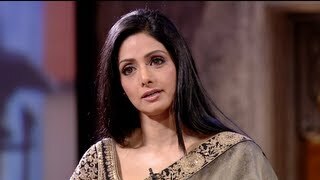 Just when we thought we couldn't be bigger fans of Sridevi, her magnificent appearance on Aamir Khan's ground-breaking talk-show Satyamev Jayate, just rocked our world. Sridevi looked divine, spoke eloquently and was so genuinely wonderful to her fan - who's had a abused life - our heart goes out to him and her. Him for surviving such unspeakable trauma, and Sriji for showing her humane side yet again. According to TOI; "When he said that Sridevi was his favourite actress, Aamir organised for Sridevi to be on the show, and Harish was more than happy about the arrangement. Sridevi chatted with him once the show was over, and Harish hasn't been more thrilled ever since." See Sridevi's handwritten note to Harish below. See Sridevi's appearance here, starting at 2.12. See archive of images of Sridevi with Aamir Khan at various events, photo-shoots, parties and premiers here. "...What about the Sridevi surprise? "Well, when I was being readied for the show, I noticed this gorgeous sari being wheeled around and actually asked a volunteer who the sari was for. I was only met with disapproving mumbles about someone random. 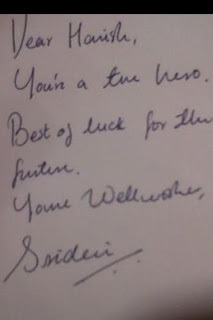 There was a reference being made to this person several times and much later I realized that this was a code name for Sridevi. I still smile when I think of all the efforts the team went through to keep the surprise genuine for me," answers Harish. We prod further... Sridevi and surprised, yes, but aren't both of you Tamil? "Yes!" pat comes the reply as Harish adds, "we actually spoke to each other in Tamil, bits that sadly didn't make it to the final edit. When I saw her, the only words that slipped off my tongue were "enakku vishvaasamillai, neenguh nijamaavuh theriyilai (I can't believe this, you don't seem to be real)" and she replied, "aamaam, nijam thaan (Yes, yes, this is real)..."